Ease and sophistication just ooooooze from everything Chelsea and Jeff do and touch. These two, cool under pressure (and why wouldn’t they be, they are ER doctors) are the most relaxed and calm couple. From their first meeting, over breakfast, following an overnight shift at the hospital, they just looked at one another, turned to me said, “yes, we would love to work with you as our planner. Please send us a contract.” Every meeting or call after, was just as decisive. 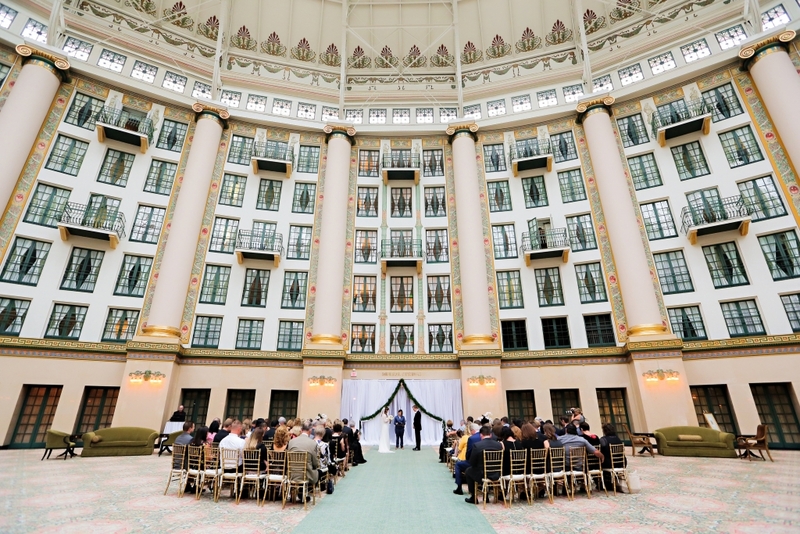 Whether it was a menu choice, their 🙂 charger decision, or who to select for entertainment, everything was done the goal of creating a weekend for their guests filled with mystique of West Baden Springs Hotel. 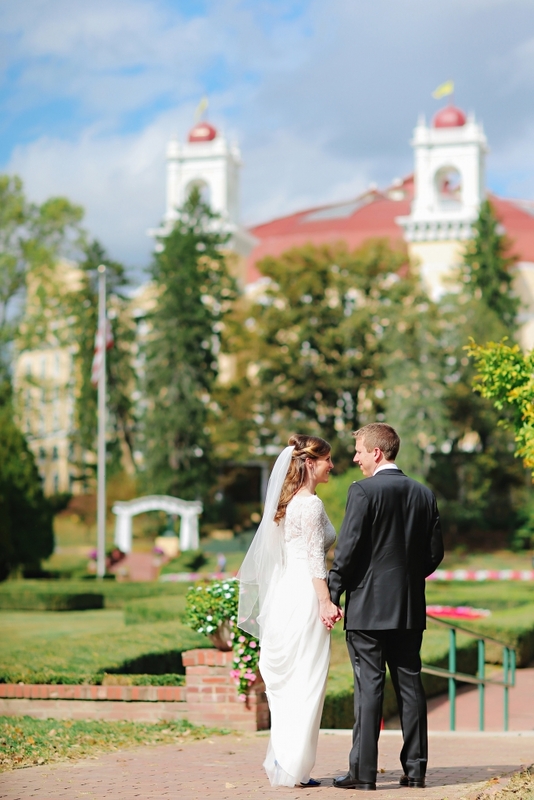 West Baden Springs Hotel, part of the French Lick Resort, appears, almost like a mirage in the southern Indiana hills, and Chelsea and Jeff wanted their guests to enjoy the weekend in the hotel’s luxurious surroundings. 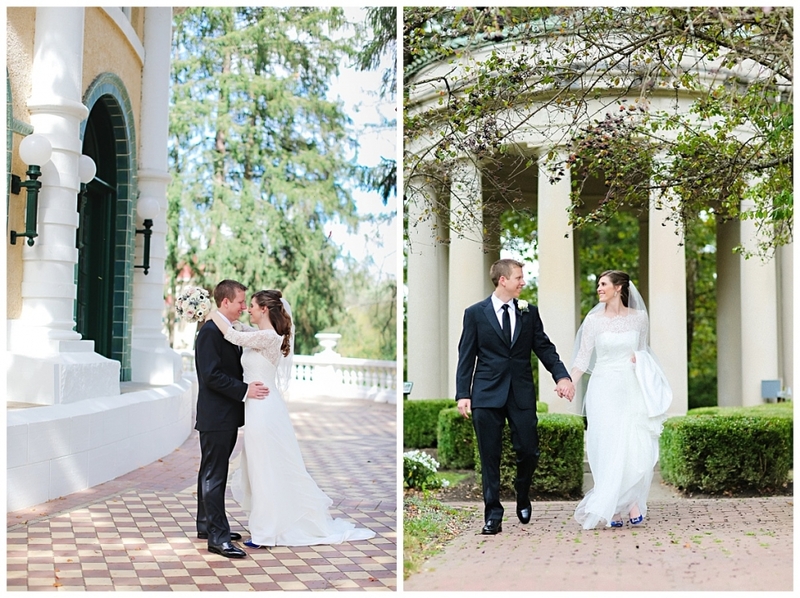 Though fall, the weather certainly gave one last taste of summer, which allowed guests, and the bridal party, an opportunity to enjoy the grounds and lush gardens. 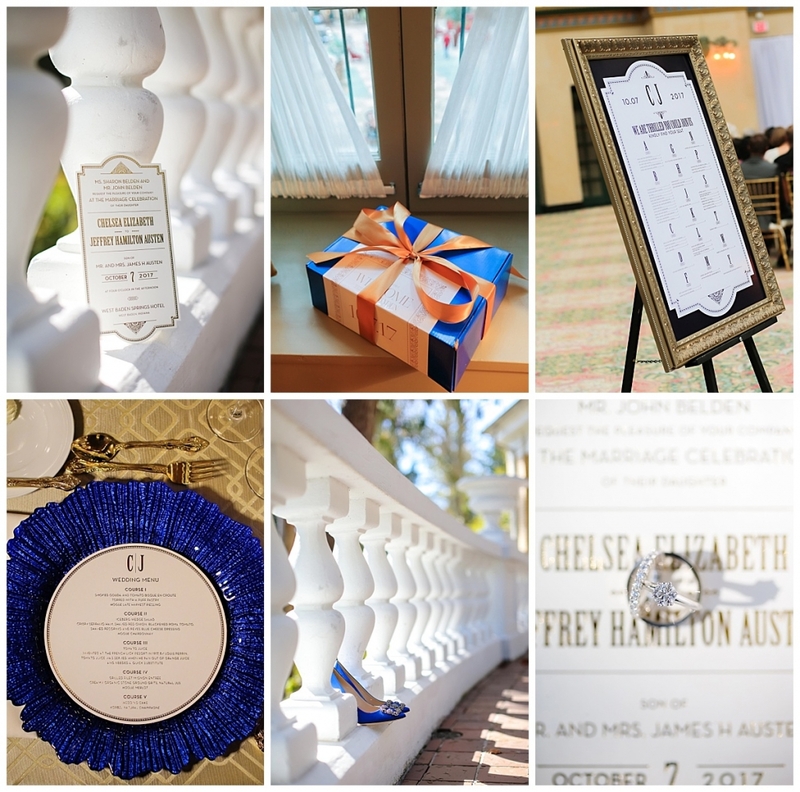 The historic architecture of the space inspired the invitation suite and paperie for Chelsea and Jeff’s weekend. The stunning art-deco invitation with gold foil provided a welcome hint of the destination retreat guests were about to experience. Chelsea wanted a touch of royal blue in her wedding, so it too was infused, in small elements throughout the stationery suite. 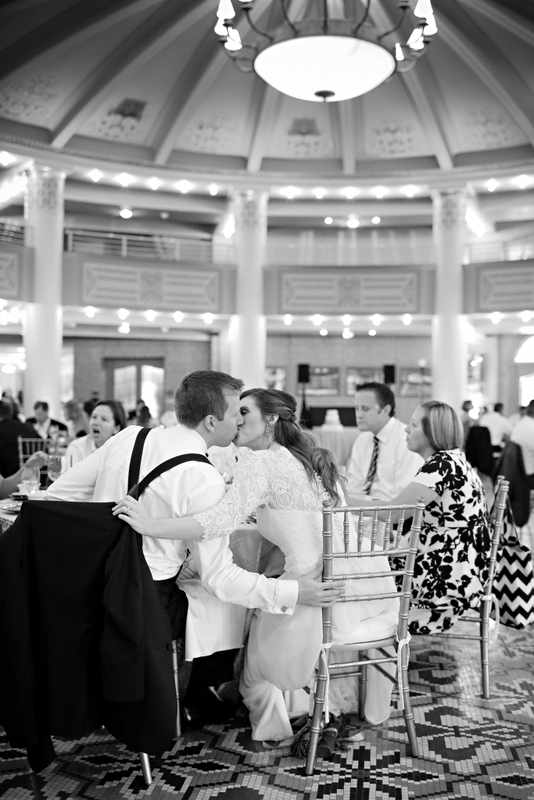 Chelsea and Jeff’s ceremony took place in the iconic dome atrium of West Baden. 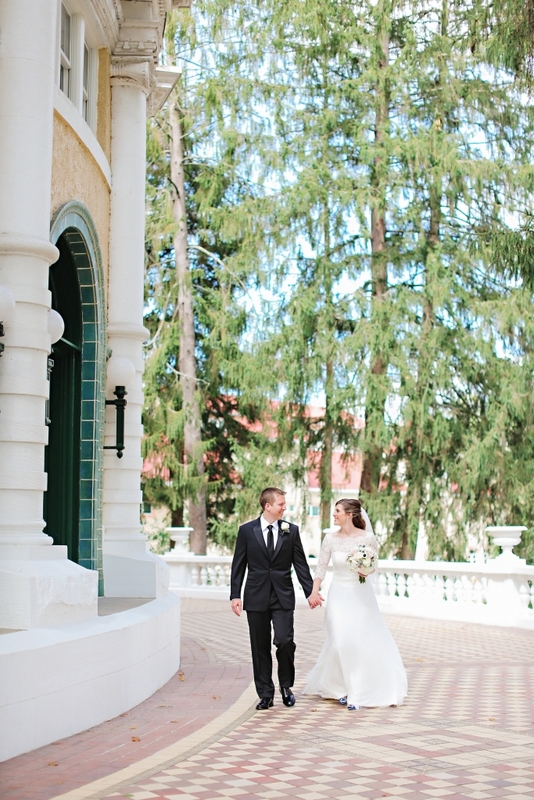 This romantic space, though large in scale, felt like an entirely private and intimate chapel. 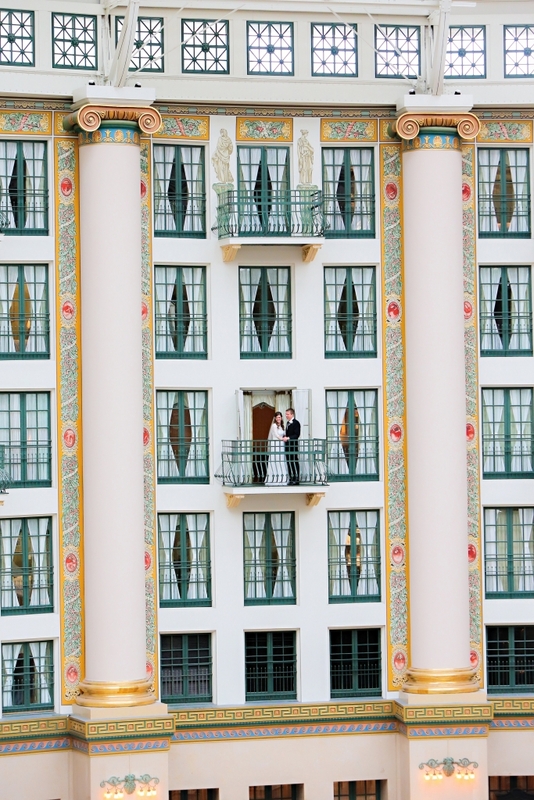 After a sweet moment together on the guestroom balconies before the ceremony, guests could be seen using their own balconies to quietly peer onto the ceremony, then cheer for the newlyweds as they were pronounced husband and wife. Jeff’s sister performed the service which included readings from Winnie the Pooh and whimsical song selections from Mary Poppins. 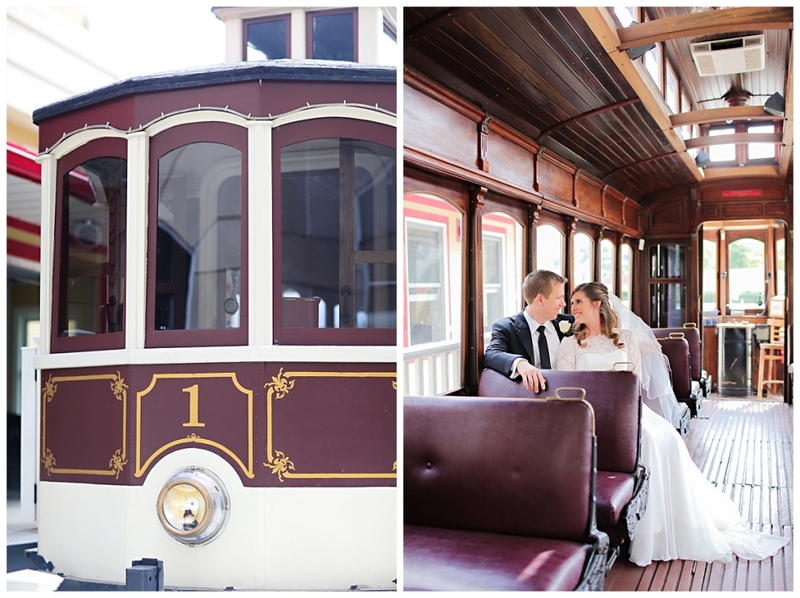 Chelsea and Jeff wanted to enjoy the entire spirit of the French Lick resort, so took a trolley ride over between the two hotels (West Baden and French Lick) for a quick photo session and captured some moments in their iconic gardens. Following cocktails on the veranda, guests entered the original lobby of the hotel which was transformed into a private ballroom for the evening. This area glittered with regal elegance. Chelsea’s vision of classic romanticism had come true, her whimsical additional of royal blue was included on the tables with the addition of stunning glass charger, and the fragrant bowls of soft creme floral were a focalpoint on the metallic gold linens. After Chelsea and Jeff enjoyed a moment of seeing the room first (and practicing their first dance) they welcomed their guests for dinner including the (now 100 year old) tradition of tomato juice served to their guests. The juice was actually invented at French Lick Resort in 1917. 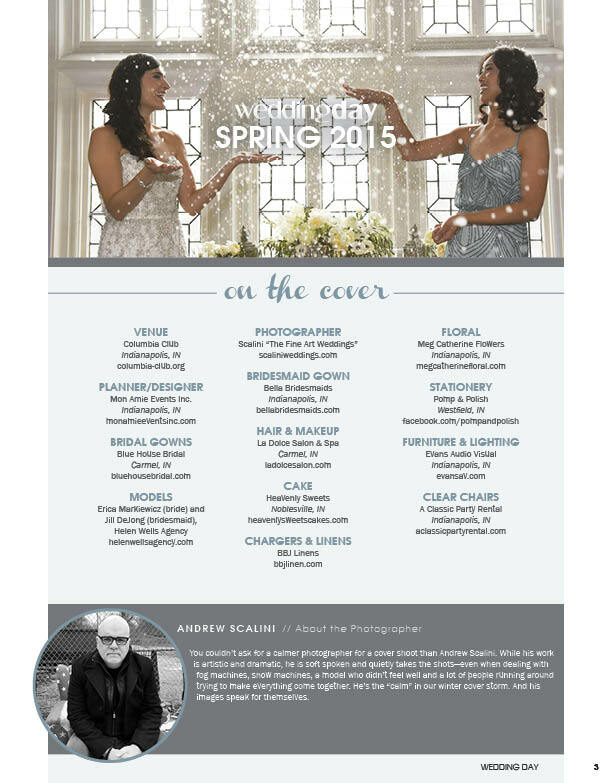 Each quarter the sleek issue of WeddingDay Magazine premiers with much anticipation. 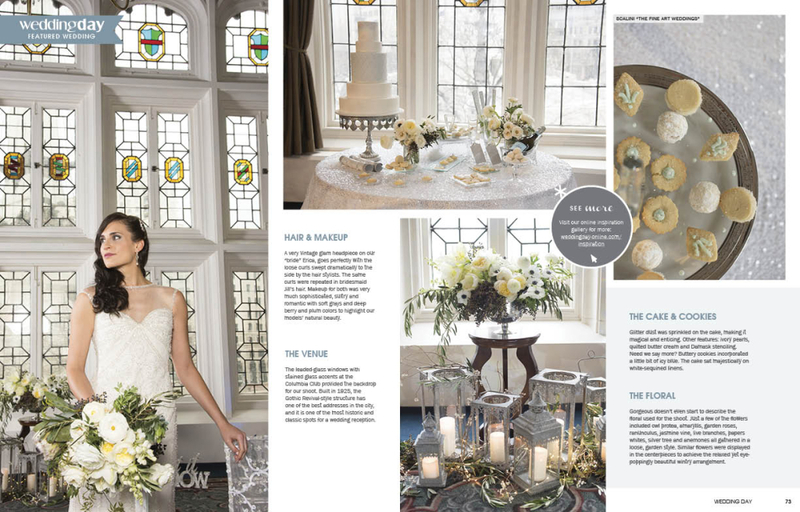 Inside its pages the beautiful magazine includes some of the state’s prettiest weddings, most couture designs and always a behind the scenes look at the cover styled shoot. This winter, once again, the editors asked me to create and plan their cover shoot. Nothing makes me more excited than planning an event where I can control the elements – all of the planning and decor elements – including the weather. 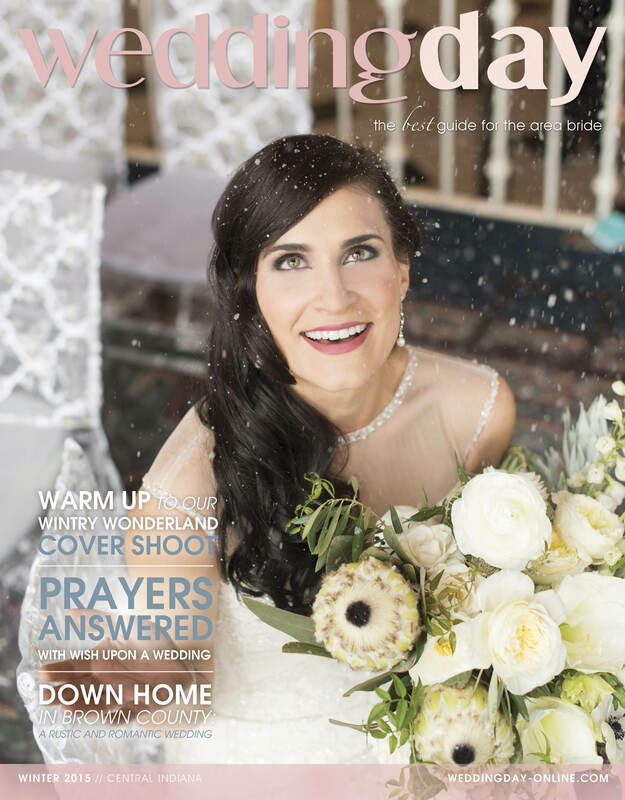 😉 For this shoot, if I was going to plan a winter wedding, I had to include snow. I’m originally from Buffalo, New York – a city famous for its snow. I grew up with snow and beautiful icy winters, and I was ready to face this cover with all of the elements of winter included. Indoors. So I brought mother nature indoors. Working with a team of professionals gathered both by the magazine’s editorial team and me, we created a wintery mix that was sure to be a perfect storm. 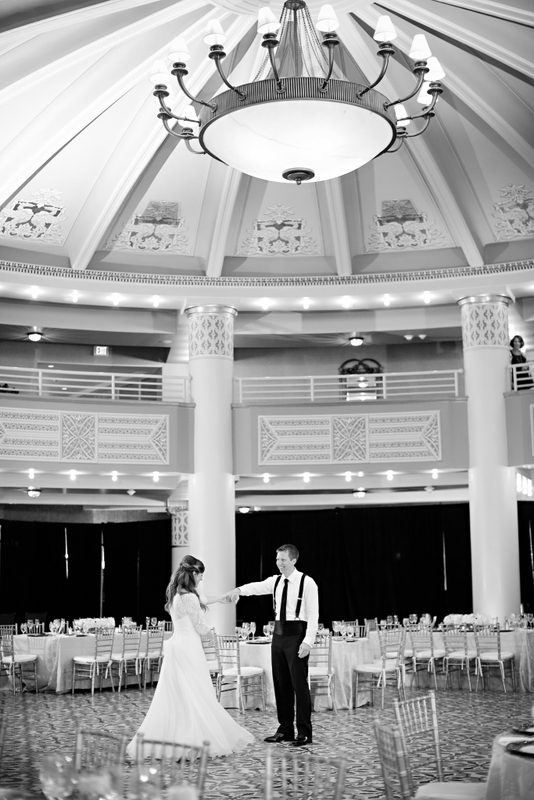 Our snow ensured the white marble ballroom of the Columbia Club’s Crystal Terrace looked like a perfect snow globe. Bride often picture outdoor summer wedding in all of their green magic – and I wanted to show the wonderful beauty of a wonderful white wintery wonderland. 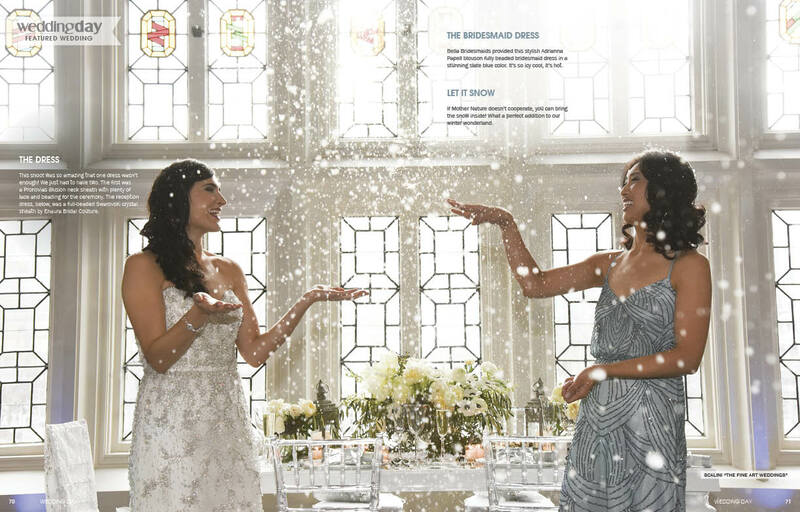 The inspiration of the snow globe included sparkling clear chairs, glittering candles and soft white florals to enhance the ice crystal gowns. The paperie mimicked the snow globe feeling and even had snow-like confetti in clear envelopes and “make a wish” favors for guests to enjoy a snowball fight during the first dance. The desert display was (almost) too pretty to each as fanciful petit fours and a dainty cake were created that was sprinkled with glittery sugar creating magical layer, like layers of snow. The flowers were a textural delight! 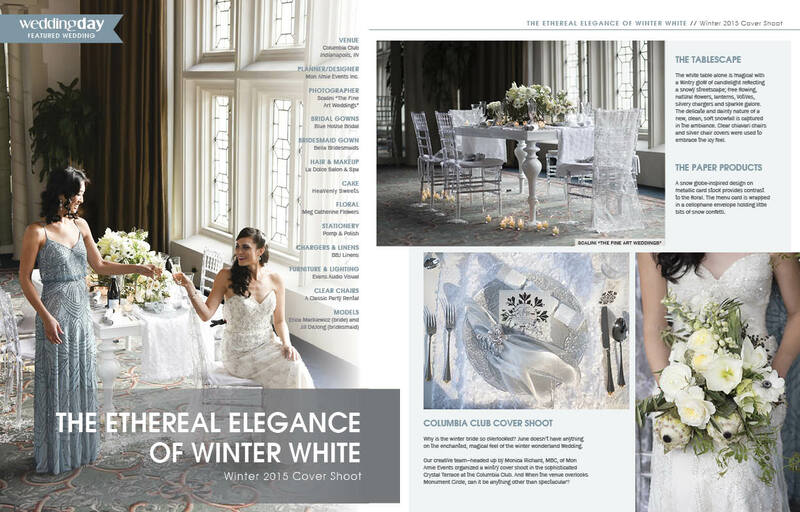 Tonal shades of white, cream and alabaster created a snowy canvas for the bouquets and centerpieces. 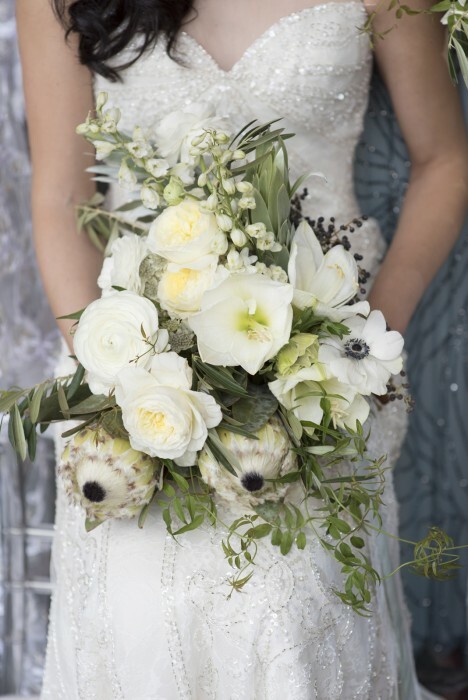 A wintery mix of roses, proteas, ranunculus, live branches and berries were used to prove even in the winter, florals can be lush and stunning. It was a day full of amazing colleagues, great collaboration, snowflakes that stay on my nose and eyelashes…. and “a few of my favorite things” Thank you to all who made this cover, and this magazine, possible.